Ants run a tight ship. They organize themselves into groups with very specific tasks: foraging for food, defending against predators, building tunnels, etc. An enormous amount of coordination and communication is required to accomplish this. To explore the evolutionary roots of the remarkable system, researchers at The Rockefeller University have created the first genetically altered ants, modifying a gene essential for sensing the pheromones that ants use to communicate. The result, severe deficiencies in the ants’ social behaviors and their ability to survive within a colony, both sheds light on a key facet of social evolution and demonstrates the feasibility and utility of genome editing in ants. The most important class of pheromones in ant communication are hydrocarbons, which can communicate species, colony, and caste identity as well as reproductive status. These pheromone signals are detected by porous sensory hairs on the ants’ antennae that contain what are called odorant receptors—proteins that recognize specific chemicals and pass the signal up to the brain. Work in the Kronauer lab, led by graduate student Sean McKenzie and published in the Proceedings of the National Academy of Sciences, has shown that a group of odorant receptor genes, known as 9-exon-alpha ORs, are responsible for sensing hydrocarbons in the clonal raider ant species Ooceraea biroi. 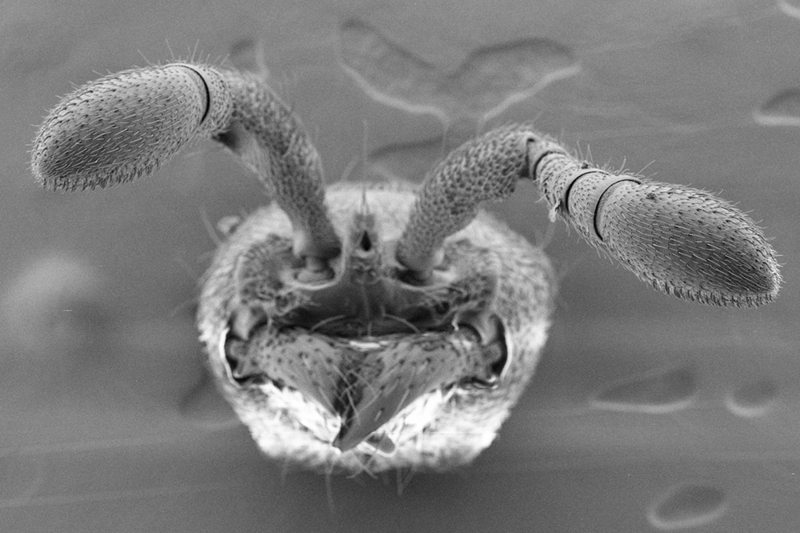 McKenzie and his colleagues also examined the genomes of related insects to determine where 9-exon ORs emerged in the evolution of this species, and found that there was an enormous duplication in this gene in a relatively short evolutionary timescale: While the ancestors of bees and ants only had one to three copies of this gene, clonal raider ants have about 180 copies. The massive expansion of 9-exon ORs happened concurrently with the evolution of complex social behavior, suggesting that the duplication of odorant receptor genes was vital to the development of ant communication. To further dissect the role of odorant receptors in ant communication and social behavior, the Kronauer lab disrupted a gene called orco, required for the function of all odorant receptors. Introducing the mutation—using a genetic manipulation technique known as CRISPR—was easy. The challenge was keeping the mutant ants alive. Ants typically travel single-file, sensing the route by detecting pheromones left by the ants in front. Using an automated system that tracks color-coded ants and an algorithm that analyzes movement, the researchers observed that, among other behavioral abnormalities, the mutant ants couldn’t fall in line. The finding suggests that the missing odorant receptors are crucial for pheromone detection, and therefore social organization. Now that the lab is able to generate mutant ants, Kronauer has a bucket list of genes to explore, including those related to the division of labor between groups. “We’ve successfully taken a gene out, and next we’d like to put a gene in. We have a whole new world to explore,” says Kronauer. Kronauer studies evolution in insect societies at the level of the gene, individual, and colony.